This weekend I need to get started on a the newt quilt. Now that I have kind of changed my plan of attack, and am making the background at least 3 different colors, I may not need to go buy more fabric. We will see. I also need to sew my oldest niece’s pepper pants. She wanted a pair of pants with hot peppers on them, because of some fabric she found at my Mom’s house. There wasn’t enough fabric in that remnant, but I found some online. I have them cut out, just need to get them sewn together. Her family is coming out to Colorado to go skiing over Presidents’ Day weekend, so I will get the chance to have her try them on and see if they fit, will check how they fit on her sister, too, so maybe I can make her some fun pajama pants. I am envisioning them mostly as “lounge-around-the-house” pants but she has kind of an interesting fashion sense so she may wear them out of the house if her mother allows. I had a kind of unusual fashion sense myself as a kid, (if you couldn’t tell from the improvised Wonder Woman costume). A lot of my clothes were hand-me-downs, thank goodness I had some older girl cousins. I also had a teacher in 8th grade who gave me some of her older clothes, enhancing my wardrobe greatly. I also had the ability to sew my own clothes, which was mostly where the “interesting” came in. I remember an outfit my junior year of high school, I probably sewed it over the summer for school that fall: Fuschia stirrup pants, a blue paisley shell, a purple/fuschia paisley long shirt that came down past my bottom, and then a really long blue paisley shirt that came down to just above my knees. I would combine these in various layers. I also shopped a lot in thrift stores, which I still love to do. 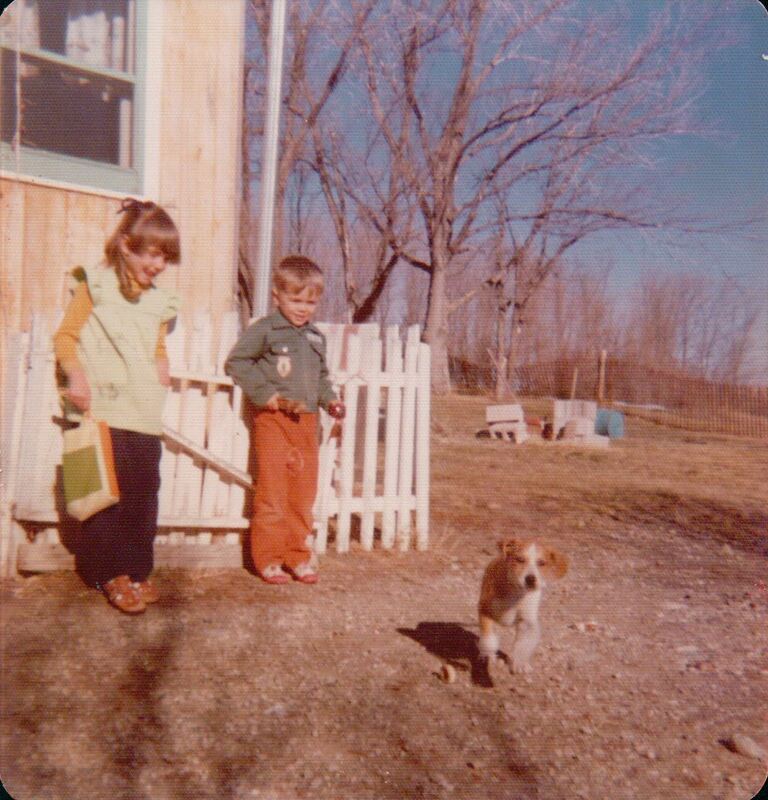 I was lucky enough to have a Mom who knew how to sew and who taught me. She still mends endless pairs of my Dad’s jeans, since he works outside with animals and tractors and engines all the time, he is hard on jeans. And she helps my nieces when they are out there, they are always putting on some show/production and want to sew costumes. I haven’t sewn clothes for myself for a while. I have sewn some for the nieces/nephews, so maybe I will get back into it, and I may go on a roll with pajama pants if this 1st pair with peppers works out. 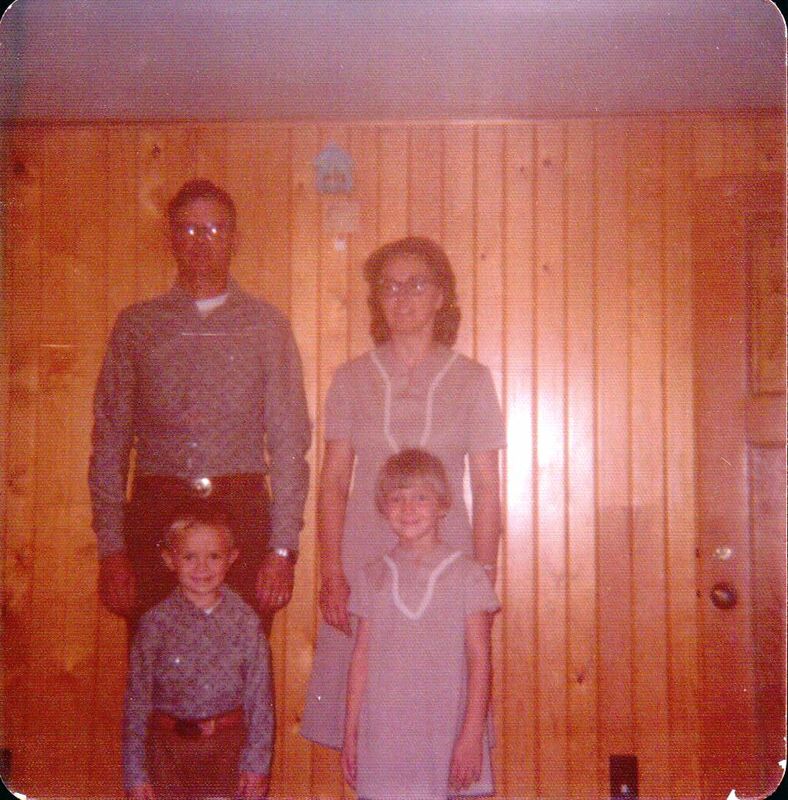 My Mom sewed our dresses and Dad and my brother’s shirts. See that blue weather cottage on the wall behind us? That is why I had to buy one when I saw it at an antique store. The one I found is not blue, however. The quest continues. This is the smock with the embroidered cartoon characters she made me for the 1st day of school (I have written about this one before.) Wade and Scratch the puppy also in the picture. 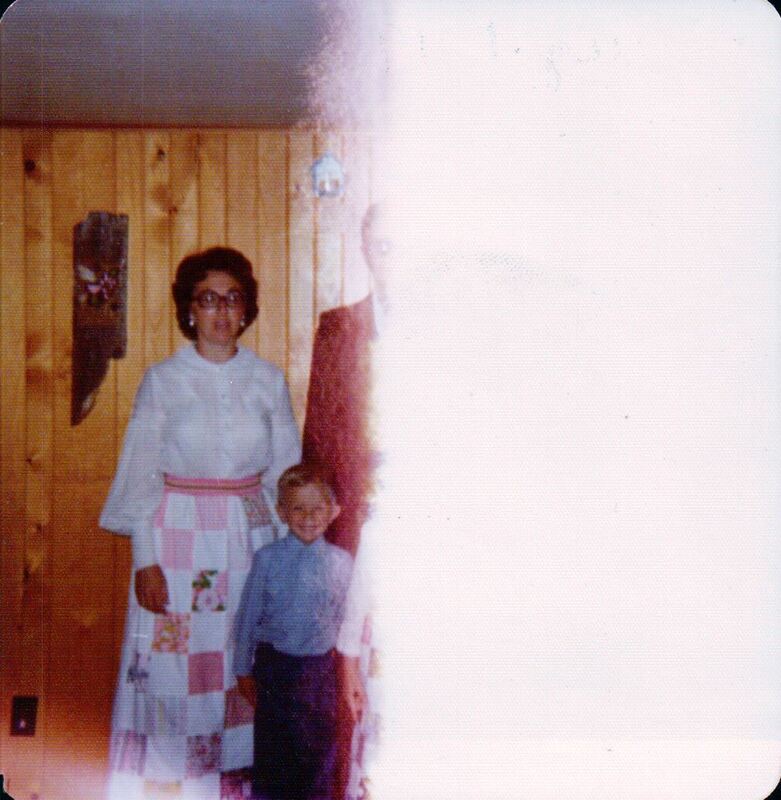 Something funny happened with this picture, but you can see Mom’s skirt – I had a matching one. They are still in her cedar chest. She thinks we should let the nieces play dress up with them, I think I should make them into a small quilt. We will see. 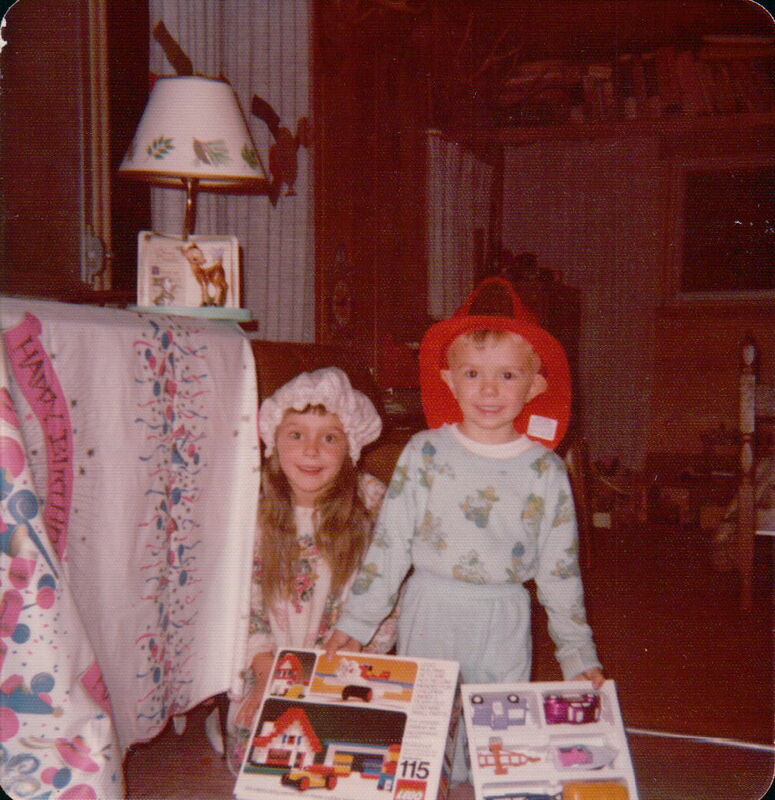 Pretty sure Mom made my night hat here – I was very into the Little House on the Prairie books at this time. Don’t remember if she sewed my nightgown or if that was a gift – if it was a gift, I am pretty sure it was from Aunt Connie. Aunt Connie, can you clear that up? Mom and I had matching nightgowns…this must have been 1976…..Anyway, I am very grateful to come from a family of women who sew – Mom, Aunt Connie, Aunt Eileen, Aunt Betty, and others I am sure I am leaving out, all contributed to MY wardrobe and my dolls’ wardrobe as I was going up, and taught me to be creative and make things for myself. This entry was posted in Family, Quilting by glenderella. Bookmark the permalink.